A qualified engineer. Dr R Aruna Sri served as an officer in the Indian Air force. which she gave up to pursue her passion for music. As a music therapy consultant, she has associated with several social welfare organizations across the country, integrating customized music therapy with other therapeutic models. evolving HSD-therapeutic model and implementing it with rehabilitation groups. She is a pioneer in conducting music therapy for de-addiction in India and integrating music with various holistic healthcare approaches. In her doctoral research, she has revived the practice of Swara Sam Yoga, a technique to invoke one's inner healing and devised a methodology for teaching and implementing the process in therapeutic groups. She has also broken new ground, in developing a systematic method for implementing music therapy in diverse socio-cultural set-ups, adhering to International standards. She has shared her experiences on various television channels, All India Radio (New Delhi) and in several published articles. A Hindustani vocalist from Bade-Ramdas Gharana of Banaras, also qualified in Carnatic music, she brings in a unique blend of both styles in her concerts and workshops on classical music and therapy. She is also the Founder - President of Sri Research Institute of Holistic Healthcare and Self Development. 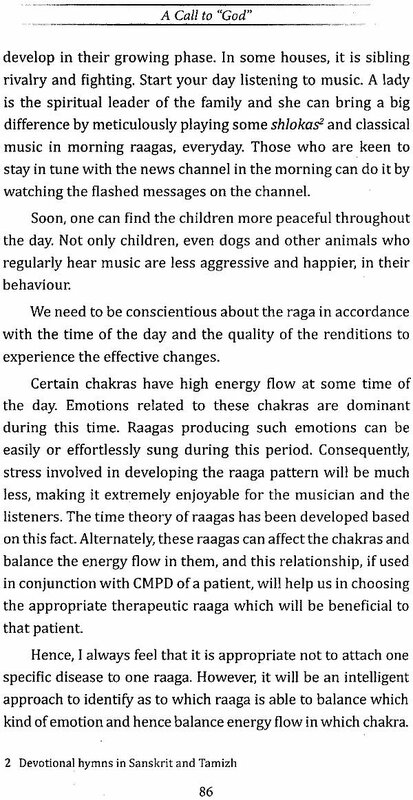 It is with great pleasure that I write these few lines of appreciation about Dr Aruna Sri's book, A Call to "God" sub-titled as a "Music Therapy for Evolution." Music pervades nature. It is coeval with the creation. There is nothing in nature which arouses our attention or affects our feelings so quickly as sound. Time plays an important role in music and like music it is born in nature. Rhythm is said to be the map or ground plan upon which a musical composition proceeds. The power of music, in soothing the afflicted heart and mind is acknowledged both in the East and West. Its power of charming ferocious beasts and venomous reptiles is also referred to by writers both of ancient and modern times. Ancient writers as well as musical authorities have dealt on the power of music in curing some of the ailments of humanity. 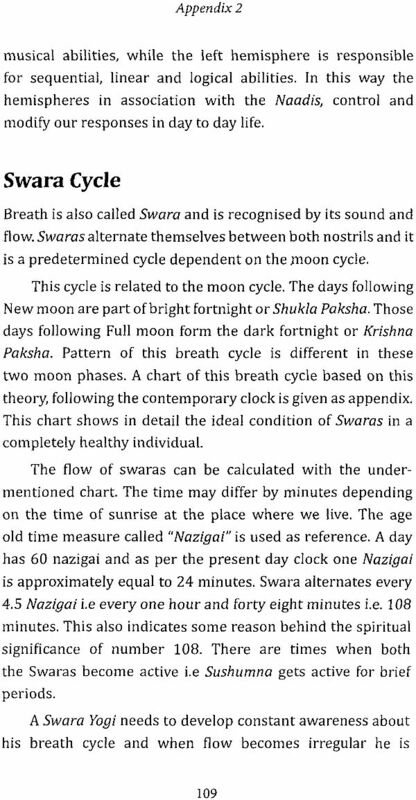 The very names of Septa Swaras are closely linked to yoga and spiritual pursuits. Yoga literally means "connection" or "Union." 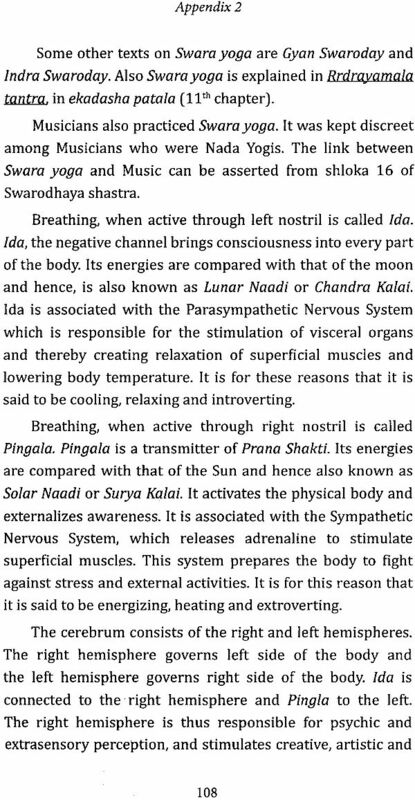 The specialty of yoga is the practical aspects of the methods of mind control for mystical and astrological purposes. In the wide panorama of Music Therapy (using music for curative purposes) throughout the ages, three different trends are detected in its conception and practice namely the clinical, recreational and educational approach. Each of them deals with social, physical or mental rehabilitation, which enables the patient to go back to his/her community. The clinical approach to music is therapeutic in the full meaning of the term. It works in depth, when applied to medical or psychological treatment of physical, mental or emotional disorder. The work demands from the music therapist a basic psychological knowledge, a high degree of musical skill and a full understanding of the nature and extent of illness. In spite of popular belief that Music Therapy is concerned only with disorders of the mind, because music affects man's body, it can be of value in the treatment of physical illness or disability. However, not many practical details relating to music during the process of therapy are available. As Dr Aruna Sri has pointed out, whatever material available is rather theoretical and not on the practical side. It is in this sphere that researchers like Dr Aruna Sri are required to face great challenges of filling the void. She is a pioneer in this area of research. Other details she has given in the appendix go a long way in enhancing the utility of her work. Dr Aruna Sri's exposition of the research is supported by authentic documents and reflects a comprehensive exploration of available source material. The following pages furnish an inclusive account of her experiences while carrying out therapy. This treatise does not pretend to be exhaustive, but provides adequate details needed for appreciating the subject well. Since the field is very vast, such a concise book will motivate beginners a lot. First few chapters are devoted to her experience with her Guru Sri Sathya Sai Baba of Puttaparthi. These influenced her in selection of research topic and also "Sudarshan Kriya" of Sri Sri Ravi Shankar Guruji of "Art of Living." She has integrated music to "Mudras," holistic practices and conducted research at "De-addiction and Rehabilitation Centers" at Delhi and among a group of Special children at Mysore. 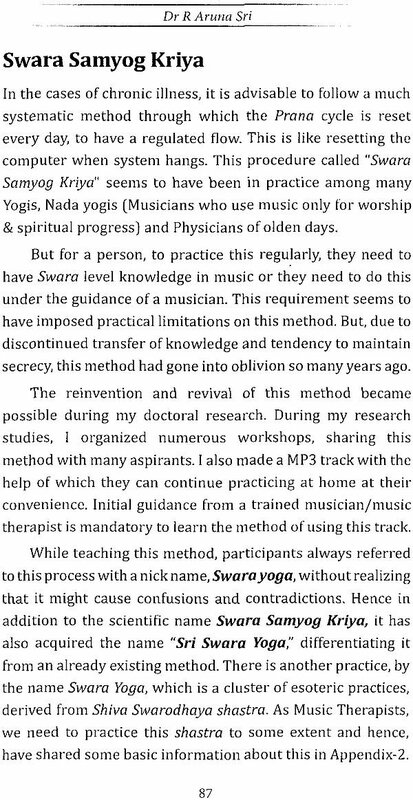 In her words "I had no reasoning or theory behind this process" and this is called by the name "Swara Samyoga" for the process revolves around the Swaras in Music. I am confident that Dr Aruna Sri's work would receive due appreciation from researchers and aspirants enhancing further inspiration. Every musician aspires to be a performing artist while learning. I am not an exception. My pursuit to excel in learning Classical Music enriched me with contrasting experiences and shaped this unique perspective of mine. There were times when Classical Music used to be an integral part of our lives. Even today we have special songs as well as tunes for birth, death, marriage, seasons, games, boating, making sacred rice grains (akshatha), churning curd etc. When the trumpet of Independence was blown during midnight of 14-15 August 1947, it dawned with the melodious voice of Sangeetha Kalanidhi D K Pattammal singing "Aaaduvoome pallu Paaduvome" on All India Radio. Again when Mahatma Gandhi was assassinated, we could hear her singing "Shanti Nilava Vendum." But times have changed since then. A few years ago, I was offered an opportunity to render a concert, at the Ghats of Ganges. A bomb blast, that occurred a week before the program, led to suspension of all cultural events. The city quickly returned to normal, and no other event was interrupted. I did not understand why singing alone had to be? This made me give a serious thought to the status of Classical Music in today's society. A similar situation was witnessed recently. After the devastating floods in Chennai, there were several viewpoints, calling for cancellation of the yearly Music Festival, terming it a cultural extravaganza. A similar tragedy, if would have happened 20 years ago, they would have broadcast several hymns, prayers and ragas, intended towards providing solace and courage to people and helped them recover from the trauma felt, after such natural calamity, towards developing equanimity. This perception of a larger section of society towards music shows that most of us identify Classical Music as an easily dispensable art form, luxury of the rich and insignificant in promoting wellness in society. This can only be termed as our ignorance. Contributions of Music in general and Classical Music in specific cannot be objectively quantified, for results are not distinctly evident in materialistic form. However, the absence of Classical Music, can tremendously affect our lives. Major reason for this set back is that we have failed to exemplify, on scientific aspects of our rich Classical Music tradition, by attaching too much importance to its facet of entertainment only. I am extremely pained to see the dogmatic and superficial attitude that has plagued us for centuries now, in both religious and cultural fronts. I envisage bringing in a change to this perspective. This was the prime reason for me, attempting to explore the therapeutic component of Classical music. 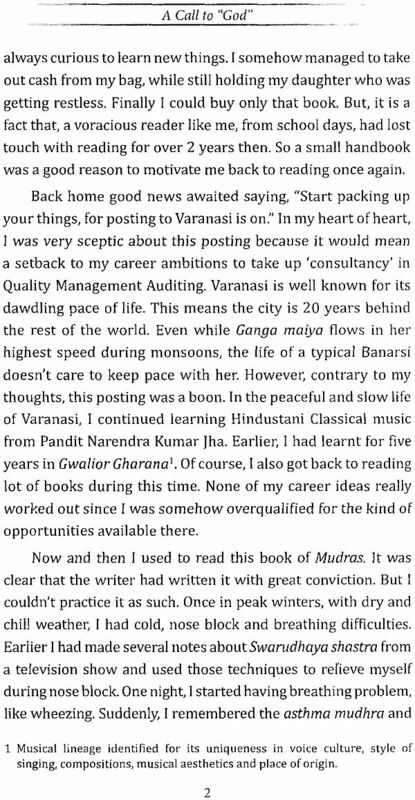 While preparing for a Masters degree in music, my Guru, Pandit Narendra Kumar Jha, who is an eminent Vocalist from Banaras Bade-Ramdas Gharana, kept encouraging me to pursue a research in Music. After reaching Mysore in 2009, I completed Masters Degree in Tamil Isai. Initially, I had some ideas about doing a research in Sampradhaya Bhajan. But a request from my Sai brother Rajesh Anna to conduct Music Therapy sessions in a school for special children set me to explore this field. I have always wanted to contribute to society through music. Since I hardly knew anything about this subject, I started interacting with many musicians who had done research in this area. Dr Padma Murthy shared some details about her research in this field. Similarly, I also spoke to many other experts who had pursued doctorate in this subject. I studied several books and carried out a detailed preliminary study by interacting with several experts and music lovers. Meanwhile, it so happened that I got an invite to attend a presentation about Music Therapy given by a renowned doctor. His presentation on the subject shocked me, since it could only create misunderstandings .about music and its scientific benefits, among the public. It was very clear that, he was using Music Therapy to shine among his fellow professionals and had no sincere intentions. The presentation also clearly brought out the fact that he had absolutely no knowledge about Classical as well as scientific ingredient of music. Within few minutes, some learned musicians and professors in music, among the audience, started muttering among themselves about the absurdity going on, on the stage and walked out in utter disappointment. Here, I realized that, absence of authentic approach and systematic methodology for implementation has been the biggest hurdle in establishing Music as a reliable form of therapy. This was also a catalyst towards my taking up a research in this field. But, many of my friends and well wishers warned me against taking up a Ph.D project on this subject, since most traditional musicians have very strong reservations about Music Therapy, and the subject has been seriously damaged by unauthentic practitioners. I was praying to Sathya Sai Baba for his direction. When I was doing service in Sri Sathya Sai Institute of Higher Medical Sciences, White field, I met Dr Hanumantha Rao. I never told anything to him. But I was contemplating on how I should proceed in this field of music. Also I was hesitant about therapy for the simple reason that I may have to make some sacrifices in the performing arena, to keep up with the regularity and continuity of therapy sessions. He read my mind and answered my query that I should take up that work, which will bring peace and happiness to all, just not me. The reply was still confusing for even concerts give happiness to audience. But analyzing further, I realized that concert singing is all about seeking validation and recognition of a set of peers, who are conditioned to sense and represent Classical Music, as perceived by them. As also, Classical concerts can be enjoyed only by a restricted group of audience who have been groomed to this outlook. Hence with no further reservation, I started my preliminary research studies in Music Therapy. When you let the supreme be the director, he takes care of everything. And soon I started getting projects, one after another. Over the first year, I had completed four projects in Music therapy. But I had to remove the first one from my list, since I had done many mistakes while taking feedbacks. It had to be counted as a learning experience. The projects, seminars, presentations and workshops all seemed to have fallen right in place, through divine directions. 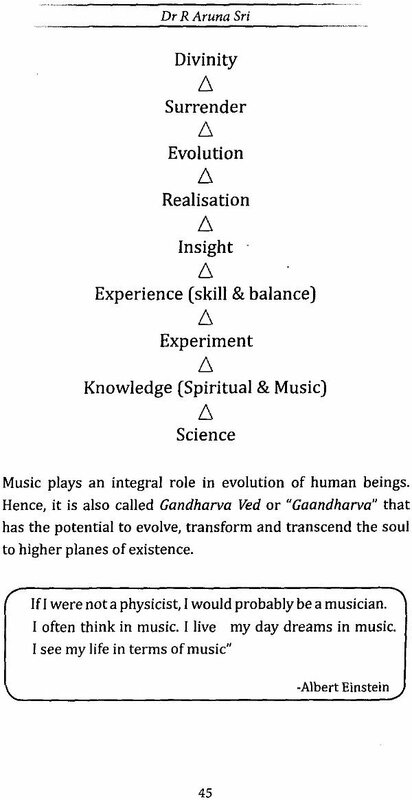 Also in 2012,during a seminar at Banaras Hindu University, and another event at Indian Musicological society, I had done a pioneer presentation about the proposed methodology for customizing classical music for therapeutic approaches. Acknowledgements that I received for this work instilled greater confidence in me to move forward, implementing this subsequently in five more projects. After I completed the research, I decided not to publish the research document as a whole, since it had all the chances of ending up as pillows or being locked up in the libraries of Universities. Over a period of two years, I recorded my speeches during awareness sessions, workshops and interviews. Hence, I discovered new ways of presenting the subject in a simple form, for the benefit of commoners. Thus came to be developed, this book of mine, with an aim to make commoners understand music therapy, clear myths, establish authenticity by linking it to traditional system called Swara Samyoga and demonstrate the significance of Classical Music in ensuring psycho-social improvement. In this book I have shared my Spiritual experiences as well as my experiences in Music Therapy. 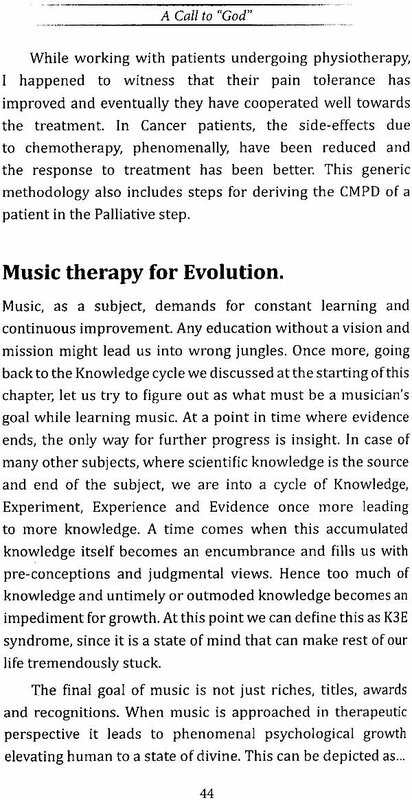 I hope this book gives a comprehensive outlook to the reader, as to what he/she needs to expect from Music Therapy. Also this book can be a source of inspiration to those who want to learn Music therapy.